Brescia, Italy: Suicide of the Lioness? Known as the Lioness of Italy for its resistance to the Austrian army in 1849 during the First War of Italian Independence, is the city of Brescia blindly building its own funeral pyre as it takes in thousands of African migrants on a daily basis? It has been argued by the left and many Catholics that the city is a model of integration and that Italian "conviviality" can succeed where Anglo-Saxon multiculturalism and French assimilationism have failed.1 Indeed, Brescia supposedly offers a third way: "interculturality" involving face-to-face "dialogue" between different cultures.2 What this actually means in practice is difficult to decipher. In any case, such claims are dangerously optimistic and utopian, to say the least. Before considering the current wave of (state aided) migration let us take a very brief look at the origins of the city and its experience during another period of large scale of migration: the Völkerwanderung. We will see that during and after the collapse of the Western Roman Empire in the 5th century AD, Germanic tribes settled in and around Brescia, as they did in many other parts of Italy, but that these warriors and their families were ultimately assimilated into the Roman population. 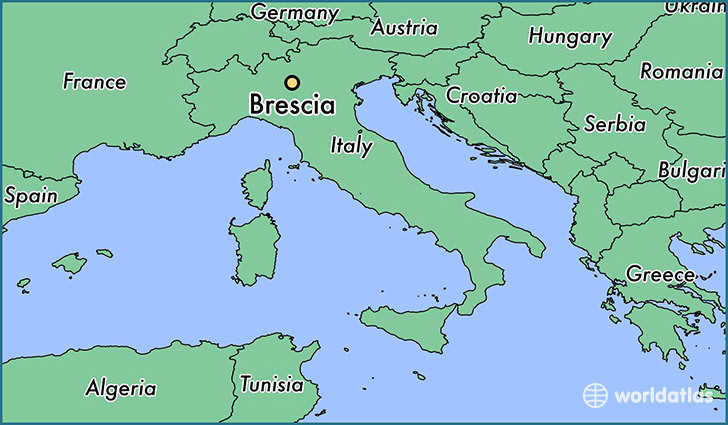 It could be said that Brescia conquered its conquerors. But what of the current migrants? As one former mayor put it, Brescia is in effect a "frontier city." 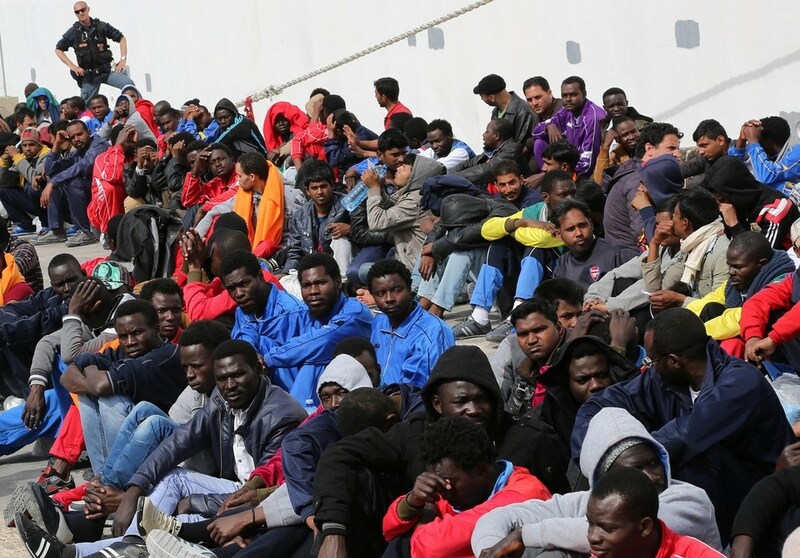 Can Africans and other non-Europeans arriving in such huge numbers also be assimilated? And, assuming for the sake of argument that they can be, how long will the process take and at what cost? 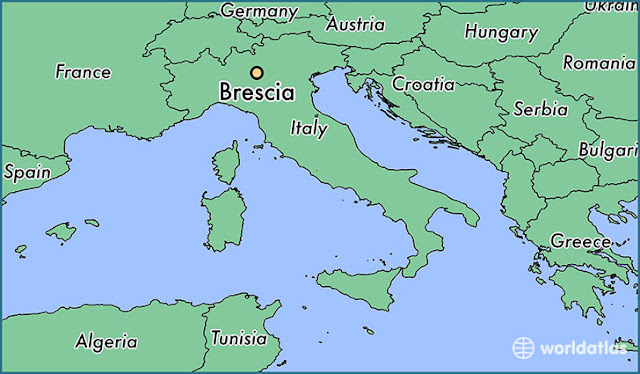 The Roman historian Livy wrote that Brescia, or Brixia as it was then called in Latin, had been the chief settlement of the Cenomanian Gauls who crossed the Alps and established themselves in Italy north of the River Po,3 which is thought to have been inhabited by the Ligurians, possibly a pre-Indo European population. In the period before and after the Second Punic War (218/201 BC), the Roman Republic defeated the Celtic tribes south of the River Po and founded colonies in the area. The Cenomanian Gauls north of the Po for their part were defeated in 197 BC and Romanisation gradually ensued. In 27 BC, Octavian Augustus granted Brixia, now a significant urban centre, the status of colonia civica augusta. National Geography and Academics call them the "New Italians"
It is estimated that less than 3% of those who cross the Mediterranean are actually fully-fledged refugees. 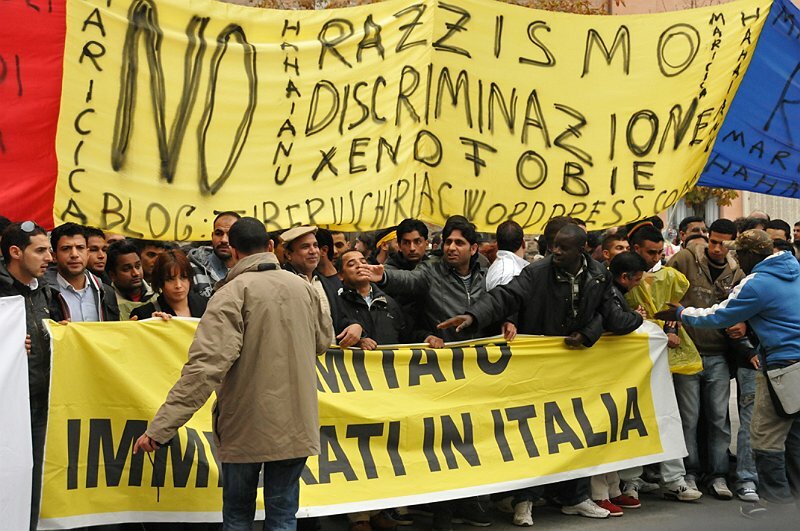 In Brescia the situation is even worse with around 72% of the arrivals classified as illegals. And these figures refer to 2016 only. Few clandestini are ever deported and most drift into the black economy, try to reach northern Europe or end up in the criminal underworld. A truly monstrous situation has arisen which amounts to failure by the state to fulfill its fundamental duty of upholding the rule of law and defend its citizens. A whole industry has now grown up around migrants: lawyers, think tanks, hotel owners, landlords and leftist/catholic cooperatives providing accommodation for them. The costs are enormous. According to one report, in 2016 the system of "accoglienza" (welcoming) was costing the province of Brescia around 2 million Euro a month! 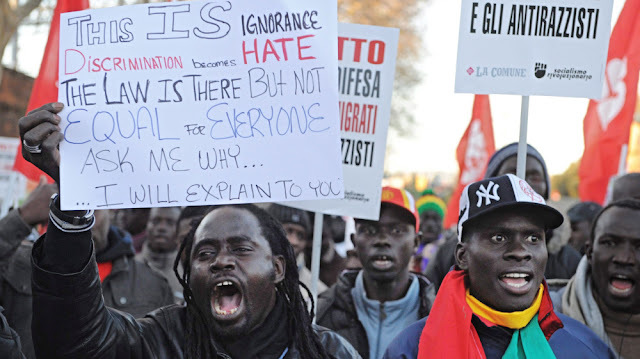 The phenomenon of migration from Africa began in the late 1980's but, to be fair, the much-maligned Berlusconi actually managed to get the situation under a degree of control thanks to his relations with Libya. Then came the chaos caused by the overthrow of Gaddafi and the civil war, the ousting of Berlusconi and a series of "technocrat" and leftist governments appointed by President Napolitano, a former communist who in 1956 backed the Soviet invasion of Hungary. Key figures in government circles are known globalists with connections to refugee organisations. Laura Boldrini, Speaker of the Chamber of Deputies, is a former spokesperson for the UNHCR in Rome and was editor of its magazine Rifiugiati (Refugees). Italian opinion now reflects the divisions we see over much of the Western World between the globalist metropolitan establishment on the one side and "provincials" and defenders of the nation state on the other. Much of the media, academia, big business, the professions, the church, the school system and polite society generally are politically correct and anti-populist. The courts too have taken controversial decisions. In a town near Brescia recently, a member of Lega Nord, the northern separatist party critical of mass immigration, was fined for writing that certain cooperatives "profit from the traffic in illegal immigrants." The judge held that the statement was "discriminatory" as asylum seekers are given temporary leave to stay in the country and technically are not in Italy illegally!8 As public anger over the situation rises (see below) such cases are likely to mushroom in future. Comparisons have been drawn with medieval heresy trials as a nervous establishment seeks to criminalise beliefs contrary to prevailing leftist orthodoxy. However, when pressed on the issue one finds that even people within these milieus will privately express deep concern, especially about Islam. 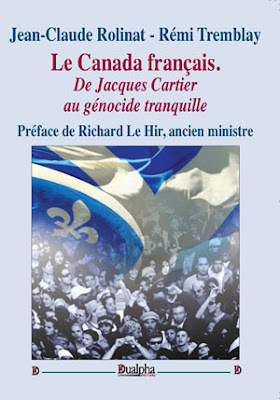 There may be self-censorship as well because opposition to mass immigration is considered provincial and low status. A survey of ten European countries conducted by Chatham House (hardly an evil populist hotbed) suggested that over half the population of those countries wanted a ban on Muslim immigration. The survey suggested that 69% of Italians have an unfavourable view of Muslims. Fortunately, two national newspapers Il Giornale and Libero Quotidiano and websites such as Tutti i Crimini degli Immigrati (All the Crimes of the Immigrants) do not hesitate to cover immigration related issues. Yet the journalist goes on to say that one reason that the school population is almost entirely non-Italian, and indeed largely non-European, is that Italian parents no longer send their children there because of the concentration of foreigners. Indeed, at times the teachers have to "educate" not only the kids but also the parents who hold regressive social attitudes in relation to activities such as mixed swimming classes. Even the journalist admits that sometimes it is "they," i.e. the foreigners, who create problems, citing a Nigerian parent who said that boys must be served by girls. We are told that time, patience and resources are required. But here we are speaking about relatively new arrivals. Other countries now face the failed integration of many adult second and third generation Muslims turning to traditionalism, fundamentalism and even terrorism. It is surely complacent to argue that such problems can be avoided by time, patience and resources. Is it not more realistic to admit a basic incompatibility of cultures? Italian progressives who pride themselves on their cosmopolitanism and openness actually seem to live in a national, or in the case of Brescia, provincial bubble, complacent in their belief that when it comes to integrating immigrants Italians do it better. They seem to have learned little or nothing from the experiences of other countries. That said, the Italian education system in particular suffers from left wing bias. History textbooks, for example, are heavily influenced by multiculturalist thinking, provide a vulgar Marxist interpretation of colonialism, push cultural relativism and fail to conduct any analysis of crimes committed by communist regimes. Classroom tasks and activities with a pro-immigration bias are commonplace. There are, however, signs of resistance at a popular level. In August 2015 villagers in Collio near Brescia protested the arrival of migrants and in November 2016 200 residents of the town of Montichiari also near Brescia staged a week long protested outside a former barracks that was being transformed into a refuge centre for hundreds of asylum seekers.13 The rejection of the left's referendum proposals and the downfall of Matteo Renzi in December 2016 was arguably in part due the government's open door migrant policy. One Sicilian Public Prosecutor has raised questions about possible connections between people traffickers and NGOs operating in the Mediterranean and even went so far as to say that some NGOs might have "interests in the manoeuvres of international speculation. "14 But without evidence and without the resources to conduct further enquiries the Prosecutor has said that the investigation has suffered a setback. It was reported in the Italian press that on 3 May 2017 Prime Minister Gentiloni held a meeting with wealthy liberal philanthropist George Soros, a man who reportedly funds NGOs operating off the Libyan coast, to discuss "investments in Italy." We shall see whether the prosecutor gets his resources. Until the next general election, expected to be held in 2018, and until perhaps we see a thorough going transformation of the political culture and the collapse of the liberal consensus, we can therefore expect migrant numbers to swell still further as Brescia, like the West generally, continues to build its own funeral pyre. A term used by a left-wing former mayor of the city mentioned in a Guardian article in 2007 about a murder wave that afflicted the city in the summer of that year. The journalist predictably blames "racism" for the city's woes. quiBrescia.it: "Brescia centro della criminalità straniera"
 The Independent: Black and Asian officers more likely to face police inquiries. The mainstream media predictably enough blamed racism for the phenomenon.